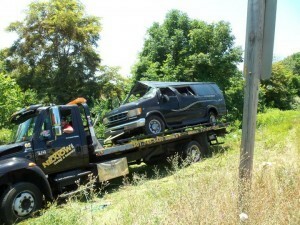 CLEAR SPRING— A church group returning Sunday morning from a youth conference in Johnstown, Pa., escaped serious injury when the passenger van in which they were riding blew a tire and overturned, rolling down an embankment off eastbound Interstate 70, west of Clear Spring, fire and church officials said. Everyone was OK, said Pastor Josh Fretz with Maranatha Brethren Church on Scott Hill Drive, east of Hagerstown. Two youths from Maranatha; seven teens from Community Grace Brethren Church in Greencastle, Pa.; and Community Grace’s youth pastor and his wife were in the van, Fretz said. “Mostly scrapes and bruises. Some fragile nerves,” Fretz said. Clear Spring Volunteer Fire Chief Mike Reid said the van overturned and rolled down the embankment at the 16- mile marker after a tire blew. Six of the 11 passengers were taken to Meritus Medical Center with minor injuries, he said. 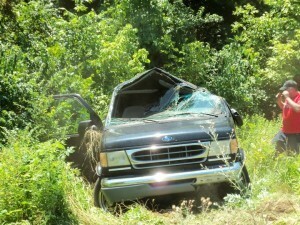 The accident occurred around 11:30 a.m. Sunday, according to Washington County Emergency Services. Fretz said minors, who didn’t have parents on the scene to waive a trip to the hospital, were required to go to the hospital to get checked. The group was returning from Johnstown, where they attended a national Grace Brethren youth conference at the University of Pittsburgh, Fretz said. The group left July 12 for the conference, he said. Praising Our Heavenly Father that everyone is alright!!! !